1. Bread in plastic bags. My gazda in ploiesti and my gazda here in Lugoj both use plastic bags to store bread. They put a bunch of loaves in the bag and hang it off a door knob or something. The problem is the bread tends to get stale. 2. No shower curtains. The majority of showers here lack shower curtains. I had to learn how to shower with out getting water all over the bathroom floor. 4. "Curent." Romanians, at least the older generation, tend to hate being exposed to wind. They believe it causes illness, toothe aches or ear aches. You'll often see people walking about town with cotton stuffed in their ears to prevent the 'curent' from entering (sometimes they use garlic). While riding on trains or in cars, it's often seen as a bad thing to have the windows open. For many people, it's preferable to sweat in the uncomfortable heat than get an ear ache. 5. Ketchup on Pizza. This struck me as odd the first time I heard about it. Romanians enjoy their pizza with a wide variety of ketchups, from spicy to sweet (I'd never seen so many varieties of ketchup till I came here). 6. People ask for the time all the time. On any given day, I can't seem to avoid being stopped on the street by someone wondering what time it is. I've also that noticed public clocks tend to run fast in this town (if they work at all), but people treat them as if they're accurate. I've been "late" to a couple meetings because of this (a popular place for meeting is under the electric clock in the town center, which runs about 10 minutes fast). 8. I've witnessed (3 times now) people painting their homes long after sunset. This one really has me stumped. There was one occasion when I was walking home at about 11pm and happened to see a fellow on a ladder painting under the eaves (without a lamp, mind you). I was puzzled, till I saw this again at another house in a different part of town (on two separate occasions). Then I couldn't help but be perplexed. There's no other explanation for what these men were doing. I mean, they each had a can of paint and a brush. Could this be some sort of benign vandalism? The infamous, but little-feared "Eaves Painting Gang?" 9. While waiting in line to pay bills, buy a train ticket etc., I've noticed that people queue up at an oblique angle to the counter, rather than making a perpendicular line. Being accustomed to queues coming straight out from the counter/window, it took me a while to get used to "slanted" lines. It seemed at first that people were trying to cut in front of me because I'd stand more or less straight in line with the server window, and other clients would approach from the side. I've come to realize, however, that they weren't cutting; it's just that our queuing styles were clashing. Also, with regards to waiting in lines, I've noticed that people tend to stand really close to each other-- so close that an American might think his personal space was being invaded. Perhaps this is a tactic to prevent people from cutting in line? As the title of this entry implies, I spend a lot of time with Cameron, the PCV in Timisoara. He happens to be crazy. But that doesn’t bother me much because I am too. He came over to Lugoj last Wednesday because we had a big town festival, Zilele Lugojului. My gazda family had friends over and we ate a big lunch. Apparently the day is a big deal in town because it’s also the feast day of Saint Mary, and she’s a sort of patron saint for Lugoj. We ate so much food I nearly popped. It was seriously the fullest I think I’ve ever been. There was soup to start out, then a roasted pepper salad, then chicken, then a second course of chicken (prepared slightly differently), then sarmale (a sort of cabbage roll with sour cabbage, ground pork and rice), and then mashed potatoes with pork schnitzel (fried in an egg batter with mushrooms). As if that wasn’t enough, there were also two cakes and an assortment of finger desserts. Oh yes, and all the while we were drinking cognac and tuica (roughly pronounced ‘soo-eeka,’ it’s a plum brandy famous in Romania). Gelu, my host father, was proud to share the cognac and tuica because he makes them himself at home. After being stuffed nearly unconscious, Cameron and I loosened our belts and wandered into the center of Lugoj to see what was going on with the festival. There were street vendors on every inch of sidewalk, selling everything from cotton candy to woven baskets. The closest thing I can relate it to from home might be a town or county fair, minus the tractor-pulls and country music. Just imagine all the tents and the crowds. They even had some inflatable rides for the kids. There were also two stages set up, one playing rock music, the other playing traditional Romanian folk music. We checked out both stages. At one point they had a blues-rock band that played a bunch of stuff by Stevie Ray Vaughn, Eric Clapton, and B.B. King. I thought Cameron was insane when he bought a kebob (I was still recovering from lunch). Cameron had to catch a train before the finale, but the night ended with a band from Timisoara taking the stage. They looked like they’d been around since the 80’s (and if I had to guess I’d say they probably hadn’t cut their hair since then). It also looked like they had been living quite well since their heyday, as their stomachs seemed to attest. And, when they started playing, it was quite apparent that they hadn’t written any new material since the 80’s. I didn’t stick around for more than two of their songs. At the very end of the night they shot some fireworks from alongside the river. Cameron often calls or texts me when something is happening in the Timisoara that I might want to check out. After all, Timisoara is a happenin’ place, as they say (although, I’m sure they say it in Romanian). So, the day following the festival in Lugoj, he texted me that a former PCV from group 19 was back in Timisoara for a visit. He also mentioned that there was going to be a meeting of the International Friends Club, a sort of loose organization for American ex-pats (as I understood it). All of this seemed interesting, so I hopped an afternoon train and got to Timisoara at about three. Cameron met me at the train station and we walked to the city center, where we were to meet Seth—the former PCV. I don’t know the layout of Timisoara very well, so Cameron led the way to Piata Unirii (pronounced ‘Pee-ot-za Oo-near-ee,’ one of the main squares, and a popular place for meeting). But enough about that. We met Seth in the piata, and he brought us to his ‘secret hide-out,’ a little bar tucked away in an alley. The place is quite well hidden, it doesn’t have a sign, and I’m not sure it even has a name. We talked with Seth for a while; he was a good source of advice. He worked in the same school as Cameron, so he was able to give an idea of what it’ll be like. After hanging out at the bar for a while, Cameron and I decided to ditch the Int’l Friends meeting. Staying at the bar seemed a better option, after all the atmosphere was cozy, the wait staff were really kooky, and they had a great playlist on. Cameron and I also went to get some Chinese food that day, and it was surprisingly good. It’s kind of crazy to think I’m in the Peace Corps and yet there are Italian, Chinese, Mexican, and Lebanese restaurants, and even a sushi bar. Cameron and I got together yet again that following Saturday for a day trip to Baile Herculane (Which means Hercules’s Baths). The town is famous for its thermal springs, which are supposed to be therapeutic. They spew out very hot, very stinky water—well over 100 degrees and rich with the unmistakable stench of sulfur. The Romans built baths on the springs, because I suppose the idea of a hot sulfur bath sounded just too good to pass up. Back then hot water was quite a novel affair. I suppose we take it for granted today. I am, however, thankful that sulfur-scented soap never caught on. The town of Baile Herculane itself is somewhat unkempt, but the landscape in the area is gorgeous. The town is nestled in the Cerna River Valley, and towering on either side are tremendous rock faces, which rise abruptly like the white walls of Gondor (pardon my LOTR reference). Cameron and I walked the entire length of the town. We found a few swimming pools and a statue of Hercules. We heard that some of the baths were free, but we didn’t really find any buildings that obviously advertised as baths. To be quite honest, I wasn’t looking too hard. On a hot summer day the idea of a steamy bath didn’t sound terribly appealing. We walked down the main street from one end to the other. At some points it narrowed to a width that would be a challenge even for a mini. We walked and walked, and it seemed that we were heading outside the city limits. But, all of a sudden we came around a bend in the road and before us stood a massive hotel, Hotel Roman. It looked like something straight out of the 60’s, probably because it was. Cameron needed a bathroom, so we figured this was a good place to stop. While he was using the facilities, I poked around the hotel a bit and wandered into what I think was a Roman Bath museum. I went back to get Cameron and show him what I’d found. However, when we tried to go back, we were stopped by a woman who tried her best to sell us massages. She asked if we had a “program,” by which I assume she was asking if we had an appointment. I asked if we needed a program, at this point still not sure what she was talking about. “Yes, of course you need a program,” she responded. I told her, “never mind, we’re leaving.” Either she didn’t hear me or she couldn’t understand my broken Romanian, because she kept on mumbling something as she went to retrieve her rate plan and schedule booklet to see where she could fit us in. “12:00 is our next opening, is that good for you?” “No thanks, we don’t want massages, we’d rather just visit a bath.” “Oh, ok. How about 1:00?” “No, really, we just want to visit a bath.” “Oh, is that right? You should go upstairs, they don’t do the massage and it’s cheaper.” Hmmm, I was confused. A bath on the second floor? Something seemed fishy about that. The lady probably misunderstood what I was trying to say. We thanked her and left. Having escaped from that bizarre conversation, Cameron and I continued on down the road. We finally reached the city limits of Baile Herculane. In Romania they make it quite obvious when you’re exiting a town because they have signs with a big red diagonal line through the town’s name. We stopped for a bit to dip our feet in the Cerna River and eat some musli with granola (which is surprisingly difficult to come by around here). Turning back around towards Hotel Roman we decided to check out some of the hiking trails. I had my Lonely Planet Guide with me, which is usually less-than-useful. It mentioned that there’s a trail behind the hotel that leads to a cave (we never found the cave). The rather ambiguous passage said there’s also a trail starting near Hotel Cerna (back in the center of town), but we never found that trail either. Nevertheless, we did take the trail near Hotel Roman. And, although we never found the cave, we did end up coming across a lookout from where we could see the entire valley. It gave us an idea of how far we had walked that day, which was…quite far. My feet were quite dirty after the hike because I was wearing Tevas. Luckily, on our way back I happened upon a fountain on the side of the street. It didn’t have a valve, so I guess it flows all the time. I slipped off one of my sandals and stuck my foot under the stream of water. MAN, it was HOT! Silly me, somehow I had forgotten that we were in a place with thermal springs. Needless to say, I was a little more attentive in washing my other foot. I forgot to mention that on the train ride to Baile Herculane Cameron and I met a fellow who had just completed a 400km bike tour that ended in Timisoara. He lives in Galati, all the way on the other side of Romania. Instead of taking his bike back home with him, he left it with someone in Lugoj. Actually, he told us that he didn’t want it anymore and had no intention of ever picking it up again. This piqued my interest because I just so happen to be in the market for a bike, especially a free bike. He gave me the number of the person holding the bike, but, unfortunately, by the time I called her, she had already given it away. Alas, it was worth a shot. Still, I thought it was cool that I should meet a guy on the train and he offers me a bike. So, what came next? Well, there was Sunday, but I didn’t do much that day. After leaving Sonny and Gloria at their hotel, I went to the train station. It was about 9:30pm and much to my disappointment I had just missed the Personal train, which is the cheapest type of train. The cheap trains in Romania are slow, dirty, and have an “interesting” clientele, but, they are cheap. And, being a Peace Corps Volunteer, such things take priority. The next Personal was leaving at 1am. I didn’t feel like waiting that long, so I begrudgingly bought a ticket for a Rapid, which is a higher class, faster and more expensive train. I had an hour to kill before the train arrived, so I went out in front of the station and sat on the steps. It wasn’t long before I was joined by some young men who decided to sit next to me. One of them turned to me and asked “speak English?” I nodded. They sort of murmured amongst themselves, I’m sure wondering who I might be. They were certain I was a foreigner, but they were shocked when they found out I spoke (some) Romanian. They asked me all the usual questions, “Do you like Romania?” “why are you here?” “do you like the women in Romania?” After a while my conversation with them waned and another fellow came by, the self-proclaimed vagabond. He wasn’t dressed badly for a young man (pretty cleanly at least) and he was smoking Marlboros. He offered me some of his beer and started talking to me about Lugoj, which is where he grew up. He told me some vague story about being homeless and living in front of the train station. I didn’t believe him. After a while he left because he had to negotiate a price with the “nasu” (a slang term used to refer to train conductors, which translates as ‘godfather’). It’s not totally uncommon for folks here to get on the train without a ticket and simply bribe the nasu. On Tuesday I had lunch with my gazda. Lily sort of showed me how to make galuste (I have no idea how to spell that one, pronounced ‘ga-loosh-tay,’ they’re a sort of plum doughnut/dumpling). Lily wouldn’t let me get too hands on because I “don’t know how to help.” I am a man after all, what can I say. The lunch was good. We had “stomach soup,” which was a first for me. Afterwards I went to Flavia’s to visit her and check my email. Her mom happened to be cooking placinta when I arrived (it’s pronounced ‘pla-cheen-ta,’ by the way). Placinta is the Romanian equivalent of pie, though its more like what the folks back home might consider pastry with a flakey crust. Isn’t funny how a lot of the content of my blog seems to revolve around food? After eating placinta I met with Sorana, one of the contacts that the previous volunteer in Lugoj gave me. She’s a student at a university in Timisoara and a very lively, vibrant personality. She and her friends invited me to get ice cream. We went for walk afterwards and I was telling her about my interest in hiking and camping. I inquired about local spots for such activities. She knew of a few. Much to my surprise, she actually called her dad and asked him to take us to one spot. Nearly immediately he picked us up and whisked us off to an inn on the outskirts of Lugoj (I was amazed at how willing her dad was to do this for me, especially on such short notice). Sorana showed me that there were some trails in the forest behind the inn. They look like they’re worth exploring, at least once. The thing is, most of the terrain in and around Lugoj is depressingly flat, and I like the hills. It’s about a 2 hour train ride to get to more mountainous terrain. We stopped at the inn for a drink, apparently the place is also famous for its pancakes (or the Romanian equivalent thereof). On the way home we stopped by a winery. They had a wall with taps from which you could sample their stock. If you liked a wine enough, you could buy it for 5.5 lei/liter (really cheap). I tried and bought a cabernet. I brought it home and shared it with Gelu. Just as we finished it off, some friends of the family stopped by with more red wine (mind you, this was at 11pm). So, naturally, we drank more. From what I’ve experienced so far, it seems Romanians have no qualms about drinking. So, that brings us to yesterday. I met with Sorana and her friend Claudia and we went swimming in the Timis River. It wasn’t bad, especially because the weather was so hot. I’d been dying to go swimming; it’s always been such a big part of my summer routine (I have many a fond memory of swimming in Mr. Mayor’s pond, the neighborhood swimming hole back home). But, since I came to Romania, I haven’t had too many opportunities to swim (except in Slanic, but that doesn’t count because it was in a salt water lake and wasn’t terribly refreshing). Without swimming, it hasn’t really felt like summer. But, summer finally came; I finally got to swim. It’s supposed to be even hotter today, so we’ll probably go again. So it’s a rainy Monday in Lugoj. I’ve been done with training for over two weeks now. Although, I’ve been so busy it feels like less than that. I arrived at site, after a long, severely-delayed train ride with my friend Cameron, who is stationed in a city nearby me. One highlight of the ride was traveling alongside a stretch of the Danube and looking over at Serbia. So, I expected my first day after arriving at site to be a lazy day of unpacking, and maybe exploring Lugoj a bit. However, instead my new gazda family stuffed me into their car to take me to Timisoara. My new gazda, with whom I’ll be staying for a month, is composed of a mother (Lily), father (Gelu), and a daughter (Raluca). Gelu’s parents also live in an adjacent house, along with his grandparents (at least I think, I’m not quite sure on the living arrangements or how many people live here—they pretty much keep to themselves). Everyone has been really nice so far and have done everything they can to make me comfortable. But anyway, I digress. So I found myself in Timisoara (pronounced “Tee-mee-shwara”), which is a big city of about 300,000 an hour West of me. Gelu went because he had to get the air conditioning in the car fixed. Lily went because she works every day in the city. The plan was for me to tag along with Raluca and her friend to explore some of the city. It’s quite a pleasant city, but I didn’t get too see too much of it, especially because tagging along with teenage girls meant I was subjected to extended periods of clothes shopping. I should have expected it. So, after I’d had enough, I left the girls and met up with Cameron (one of the PCVs in Timisoara). We ended up walking around for a while. Since neither of us knew the city layout terribly well, it was like the blind leading the blind. Good times. I only stayed in Lugoj for a few days because on the 2nd of August I went up into the mountains for a camp. Before leaving I spent some time at my counterpart’s house. Her name is Flavia, and I have been paired with her because she’s an English teacher at my school. The Peace Corps pairs each of its volunteers with a counterpart from their local community to make the volunteer’s integration a bit easier. Flavia has already introduced me to some key community members and she has helped me with many things, even buying train tickets. It will especially nice to have her as a guide once the school year begins. Before I left for camp, I went over to her house because she has an internet connection. I got to meet her parents and her dogs. Both her parents are doctors, but only her father still practices. Her mother is one hell of a cook, and every time I go over, she always has something good to eat. I told Flavia about the camp I was going to and told her about the American tradition of making s’mores around the campfire. I asked her if she’d heard of marshmallows, and to my surprise, she had. In fact, she even knew a place where I could buy some. And, better yet, the place was right here in Lugoj!! So, we went to buy them. I was a little disappointed because they were much smaller and colored differently than the marshmallows I was used to in the States. But I roasted a few on the stove at her house, and they tasted exactly the same. The other problem was finding graham crackers. I’m pretty sure they don’t exist in Romania. But, after a lot of searching I was able to find some honey biscuits at a little shop which seemed pretty comparable in size and texture (the main problem is that most of the cookies in Romania are about the size of a Fig Newton, simply not big enough for s’mores). Luckily, the third ingredient, chocolate, is readily available in Romania. After collecting everything I needed, I was excited; the kids at camp would be able to make s’mores! There was one volunteer in Lugoj before me. Unfortunately he left just before I arrived. In fact I was on the train coming, as he was on the train going. He left me a letter with notes on what work he’d done (and some contacts) as well as a bunch of stuff (all of which I haven’t looked through yet, but there were some books, a Microsoft Office 2003 user’s manual—good for some light bedtime reading, a cheese grader, staples, a blanket, a toaster, an umbrella, a mini tripod, and some other assorted and very random objects). He left the notes and the items with a girl he worked with here in Lugoj named Sorana. Sorana and I looked over the things he had left for me and just laughed. It was strangely like Christmas, though with very weird gifts. The next day I left for the Camp. It was in the mountains about 5 hours away. I met another member of group 23 there, my buddy Dan. We thought it was going to be a rock climbing camp, as the website had lead us to believe, but we soon discovered otherwise. The night we arrived at the train station, we were met by two of the people from the camp. They drove us in an old Nissan Pathfinder up an old, poorly maintained mountain road. The route was extremely winding, and bumpy. I thought it was sort of funny because Dan had been on the train for 12 hours and really had to pee, so the bumps didn’t really help his situation. I imagine he’ll eventually read this and just shake his head that I’m telling the world about this. Dan and I are good friends, it’s really too bad we’ve been assigned to sites on the opposite ends of Romania. So eventually we got to the Cabana on the mountain where the camp was. Oh, I forgot to mention that the Nissan’s headlights were sporadically flickering on and off throughout the entire ride, which added another element of suspense. When we got to the cabana, we were shown our room, which was basically of hotel quality. It had a bathroom AND a shower AND toilette paper—well beyond my expectations. When we met with the other counselors, they told us a little bit about the “climbing” schedule for the next day. Dan and I were excited about trying our hands at climbing. The next morning we just went for a hike with the kids. Dan and I were a bit confused, but we figured the climbing was going to happen in the afternoon. Instead, we had lunch, a three-hour nap (the nap happened every day after lunch, and I quickly became a fan) and in the evening, a lecture on ecology (in Romanian, of course). So, the entire day went by without any “climbing,” as I might define it. Dan and I soon discovered that Romanians loosely translate hiking as “climbing.” This is just a small example of my many cultural misunderstandings. But anyway, apparently the camp does in fact have “rock climbing” programs, but not for the particular group we were with. Instead we just hiked a lot. On the second day, after hiking a 7000+ ft. mountain (Carja), the main leader, Peter (a biology professor from Cluj, and a very interesting guy) told the kids that they’d be going to the “disco” later that evening. Dan and I were confused again. Could there really be a disco on this mountain? Maybe they were going to take the kids to the nearby town? Or, maybe “disco” meant something completely different in Romanian and we were misunderstanding. Maybe when they said “let’s go to the disco” they meant “ok, time for bed!” We didn’t know; we figured we’d just wait and see. Our experience with “climbing” proved we had a lot to learn about Romanian expressions. But sure enough, after Peter gave his last talk of the night, he sent the kids off to the disco. Curious, Dan and I followed, and discovered that right next to the cabana was a disco, complete with lights and a fully-stocked bar. I mean we were surprised to find toilette paper at this camp, but a disco too???!!! Apparently this place was full of surprises. I’ve discovered that Romanians are quite fond of the disco. The day we did that higher elevation hike, up the 7000 foot mountain, the fog rolled in quite heavily. It was nice and cold that day (maybe about 40 degrees F, a nice change after the stifling heat in Ploiesti). But, the fog was so thick at times I couldn’t see three people in front of me on the trail, and water droplets formed in my hair and on my clothes. We were able to make it back to the cabana just before the rain came (literally minutes before). But, unfortunately, the rain wasn’t a passing fad, and the fog stuck around too. As you can imagine, this put a damper on our hiking program. We ended up sleeping even more, and playing games with the kids, including chess and some Romanian card games (0ne of which is identical to UNO). 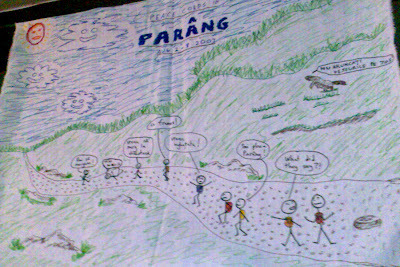 There was also a sort of arts and crafts session, in which Dan and I made a poster of our experience hiking with the kids: a picture of us hiking in a line on the trail, with all the kids saying things in Romanian (actual quotes from the trail) and Dan and I—the two Americans—at the end, puzzled over what everyone is saying (which is sort of silly, because obviously we did understand). The Poster, sorry that it's a little fuzzy. The guy at the front of the line is our leader, Peter, yelling at a kid to get going ("Hai sa mergem! "), the kid simply responds, "am murit" (I've died). In this picture the fog was pretty mild. Usually it was more like pea soup. It rained and rained (in fact, as I write this it’s still wet outside, which is quite a change from two weeks ago when it was drought-like). I began to get worried because it looked like we wouldn’t have a chance to make a camp fire for the s’mores. But, luckily on the last night there was a break in the weather and we did manage to make the fire. It seemed like the kids really liked the s’mores. I returned to site on the evening of last Wednesday, and decided I to go Cluj for the weekend. So I only spent one day at site before going to Cluj. I left at the ungodly hour of 5 in the morning and got to Cluj shortly after noon. I took a train route that went through the towns of my friends Mandy and Noelle, who were also going to Cluj, so we could take the train together. While we we in Cluj there was more rain, and then some rain. Additionally, we found a place called the “Infuriated Doughnut” (Gogoasa Infuriata), which I thought was a great name for some reason. The city itself is quite beautiful, and seemed to have the most “western feel” of any other city I’ve seen in Romania. It seems like there's a lot going on there, probably because of the large university population. We stayed with some other PCV’s who have an amazing apartment, nicer than many I’ve seen in the US. We cooked dinner our last night there as a way of saying thank-you to our hosts. It was a sort of Mexican concoction, with chicken, beans, rice, tomatoes, garlic, lime juice and chili-powder (no cumin to be found in Romania). We also made some pretty sweet guacamoli. We couldn't find tortilla chips, so we substituted with some less-than-brilliant wheat-crackers.